We've come to our last day of our organization week, I hope you have all enjoyed the peek into our stamping spaces. Today we are sharing an overview of our stamping areas. My stamping area is in a corner of a bedroom, it isn't a whole room. Along one wall I have my large tower of paper, and a few Expedit Units in a couple of different sizes. The one in the middle has a desk attached to it. 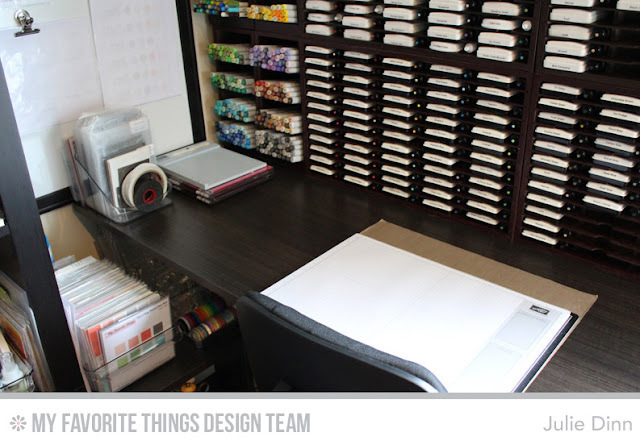 On that desk I have my paper trimmer, die-cutting machine, and my printer. I like to have all my toosl in reach when I stamp. This unit sits right beside my desk. It houses my background stamps, stencils, 12X12 specialty papers, embellishments, all my tools and adhesives. On top of the unit I have my stash of glitters and coloured embossing powders. I also have a jar full of micro beads and Prills for shaker cards. On my desk I have a small plastic container that was designed for use in the kitchen, I use it to store the stamps and dies for the current MFT Release. I also store my Scor Tape and foam tape in the front of the holder. Beside it sits my two MISTI's, (yes I have two, one for stamping and one just for background stamps) and my small scor-board. At the end of my desk I have a large white board where I hang up a print out of upcoming MFT sketches and Color Challenges. One of my favourite things in my room is my color cart. 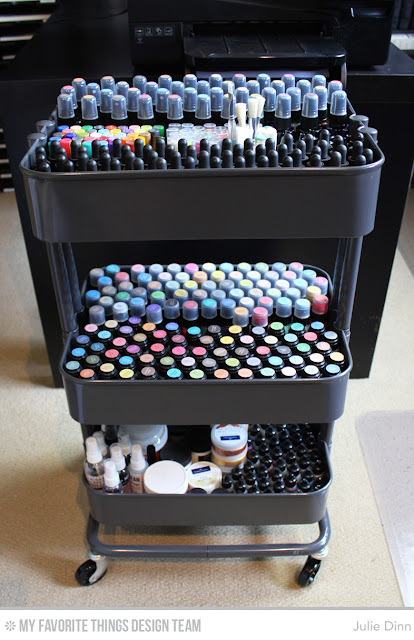 This cart is filled with inks, sprays, paints, gelatos, mixed media mediums, and all sorts of fun stuff! The cart normally sits in my large walk in craft closet, but when I am having a stamping session I bring it out. Thanks again for joining us this week. 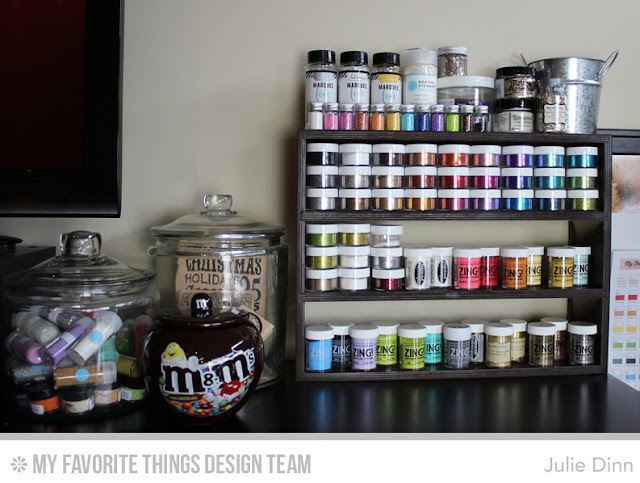 I hope we have inspired you to organize your crafty space. We would love to see pictures of your space, you can upload them to the MFT Facebook groups any time. Be sure to check out the MFT Blog to see a few more rooms. 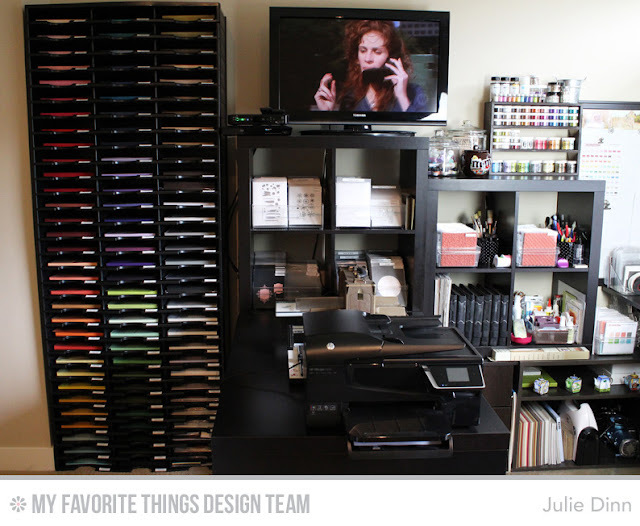 Wow, I love your craft room and how you have everything out where you can see it. You're really making me rethink my own craft space. Thanks! Hi Julie! 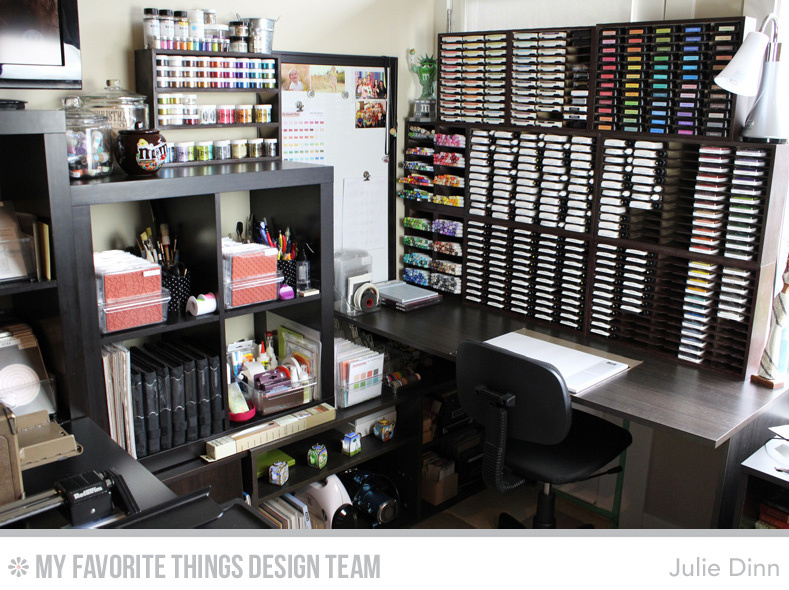 OH my goodness what a fabulously organized [and chuck-full of goodness] space! LOve the dark wood - very classic. I'm coveting your massive stash of MFT background stamps - I store mine the same way, and also clip print-outs of my current challenges at eye level as reminders. Thanks for the invitation - OH one last thing - I'm seeing many Zing bottles there, which is your favorite for white embossing? I'm looking for one that melts down nicely for a smooth finish. Thanks for the advice - love every single bit of magic you create here! Me encanta su espacio de trabajo, es una muy buena inversión si se dedica a tiempo completo. Yo tengo tanto desorden, porque tengo mucho material y poco espacio. Intento hacer orden, pero es imposible. You organized amazingly well for a corner of a bedroom!! Love the refrigerator bin storage sets in your black shelving, nice contrast! Your color cart is fabulous! 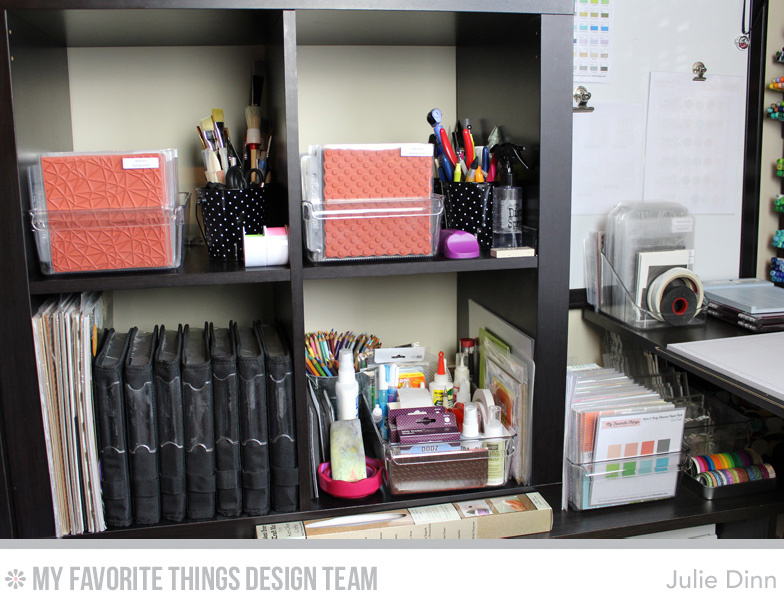 Thank you Julie for sharing your great organizational tips with us. There are just a "few" (haha) of your ideas that I hope to incorporate into my dream craft room one day! You must love having all that natural light streaming into your office! Your space is amazing! Love your tower of paper! I have a small one from the office supply store and it is packed full! 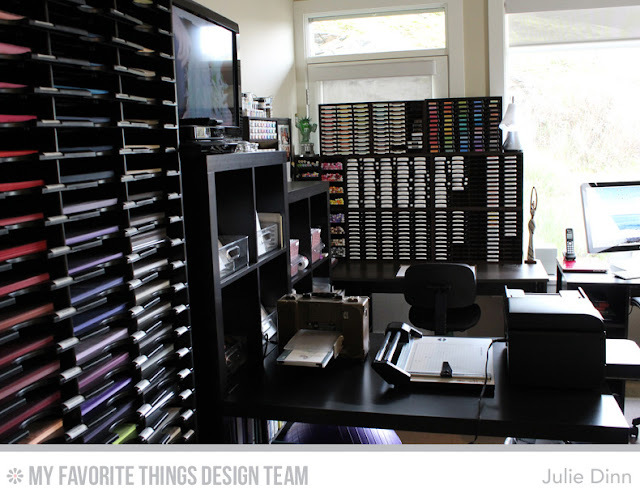 Your craft room is so neat! you have everything so handy!